The 15-year gilt yields increased by 13 basis points during October 2.31% after being as high as 2.38% earlier in the month after Greece announced that it was close to agreeing the next 31 billion euros of the bailout deal and Spain avoided a downgrade of it's credit rating to junk status by credit rating agency moody's. Later in the month estimates of Greek debt increasing to 189% of Gross Domestic Product (GDP) which was higher than expected and Spain's economy shrank by 0.3% during the third quarter, the fifth quarterly contraction in a row. As a result of the general bad news investors have been moving funds to safe havens such as UK government bonds and gilts forcing prices up and yields down. 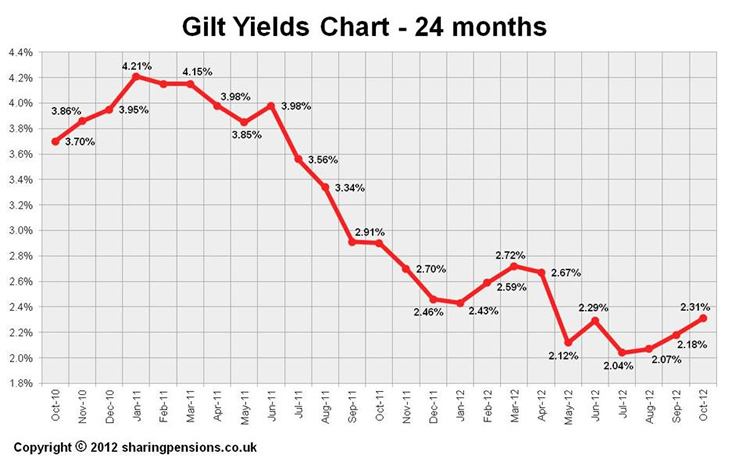 Even though gilt yields have increase, annuity rates have reduced with standard, smoker and impaired annuities lower by up to 6.5%. Overall standard annuity rates are lower by 0.90% and smoker rates by 1.77%. Although the data suggests that annuity rates can increase in October by between 2.20% to 3.07% the new EU Gender Directive is likely to force annuities lower by 21 December 2012. For the latest updates see Annuity Rates Review.